The Hampden Community Archaeology Project, in conjunction with the Hampden Community Council and the Center for Heritage Resource Studies of the University of Maryland, announces a community history workshop to discuss our oral history project in Hampden. This workshop will consist of a short presentation by Jolene Smith, coordinator of oral history for HCAP, followed by an open discussion of what these kinds of stories mean for the Hampden community. HCAP Co-director, David Gadsby will also be available to discuss June and July excavations on Falls Road and Hampden’s heritage. The workshop will be held at the Roosevelt Recreation Center, 1221 W. 36th Street in Baltimore, from 7:00 to 8:30 pm on Thursday, January 24. Light refreshments will be provided. Join us if you’ve got stories to tell, or are just interested in the history of the neighborhood. All are welcome. After the successful excavation of six sites over the past three summers, we have got a lot of amazing information to share. You can see what we’ve done and get regular updates on our progress from our website, located at http://www.heritage.umd.edu/CHRSWeb/AssociatedProjects/Hampden.htm, and our weblog, at http://hampdenheritage.blogspot.com. 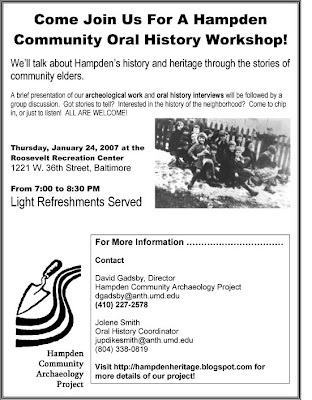 The Hampden Community Archaeology Project is sponsored by the Hampden Community Council and the Center for Heritage Resource Studies at the University of Maryland-College Park. Additional funding for 2007 has been provided by the Sociological Initiatives Foundation, the firm of Struever Brothers, Eccles and Rouse, and the Rackham Graduate School of the University of Michigan.